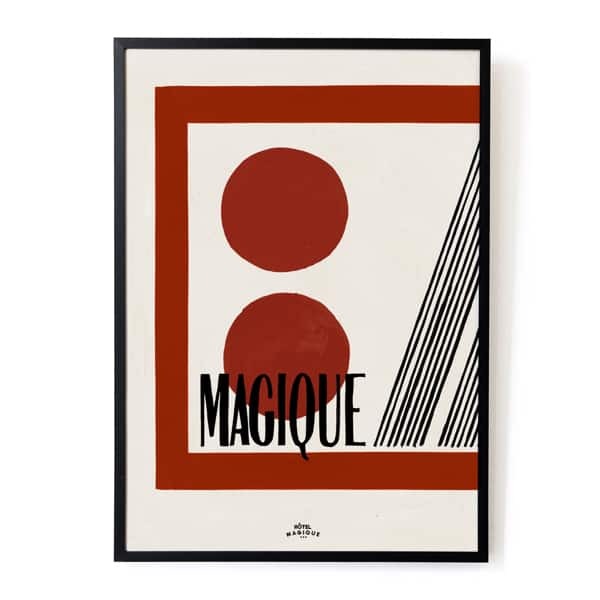 Hôtel Magique is a brand with a base in graphic design. Creative Director, Milou Neele has cleverly created beautiful illustration art prints from her studio in Amsterdam and they are now available in Australia through Monsoon Living. After a series of exhibitions and freelance work, Milou gained print and textile design experience working alongside fashion house Scotch & Soda. After seeing her designs come to life across many collections, she decided it was time to take a leap of faith and has been working independently ever since. Whilst on a trip to the USA in 2015, Milou stumbled upon a piece of amazing Japanese golden momi paper. Once back home in Amsterdam she painted a hotel-vibe artwork on the momi paper as an art piece for her home, saying ‘Hôtel Magique – 8th Avenue & 51st – Open crazy late’. She fell in love with the word ‘Magique’ which planted the seed to build a brand with magique-related artworks, combining both her love for hotel nights and paper goods. * Please note this print comes unframed. We may from time to time sell works framed in-store, so feel free to visit our bricks and mortar store if you wish to purchase framed works. * We do our best to displayed our images accurately, but since each screen is different, colours may vary slightly when you see them in print. If you wish to see our prints in person prior to purchasing, please visit us in-store.